Could a few thousand cheap, cute, igloo-shaped geodesic domes solve the Canadian Arctic’s housing crisis? Looking at the history of domes in this region, the answer has to be… maybe not. Just ask people who have lived in Arctic domes about what they’re like. 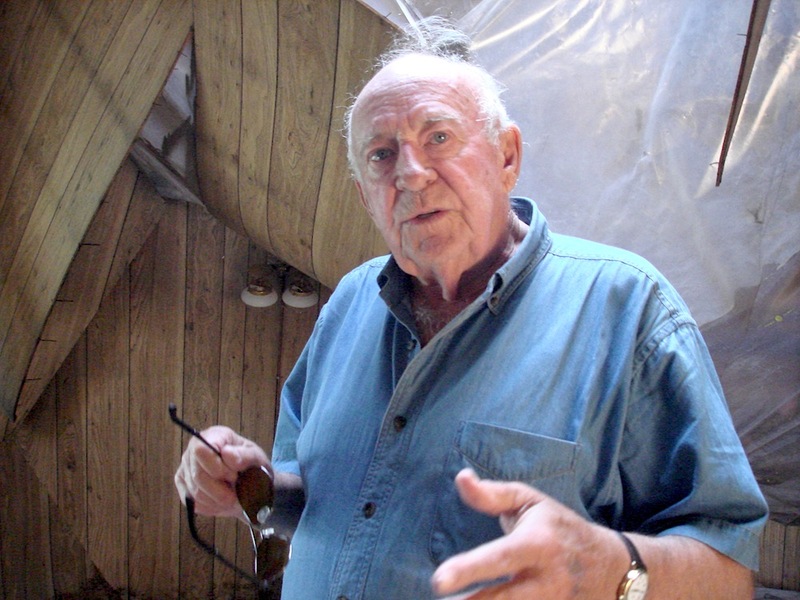 Sam Kapolak, who also lived in one of several domes built in that western Nunavut community, said he didn’t like dome living because the domes lacked insulation, and ice would form on nails inside. The only advantage of a dome over an igloo was that the dome didn’t collapse in the spring when the ice melted, he said. Built in 1971, Bathurst Inlet’s domes were replaced by more conventional homes in the early 1990s. But the metal-clad domes — of which three still stood in 2008 — were the brainchild of the late Glenn Warner, a former Mountie who opened the Bathurst Inlet Lodge in 1969. 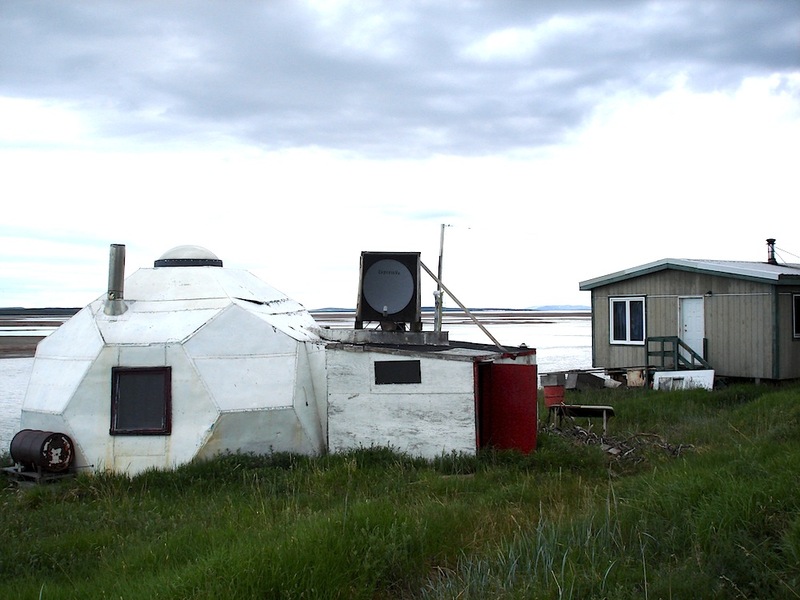 Warner told me in 2008 that the Government of the Northwest Territories was delighted with the dome house idea, because in 1971 building a dome cost much less than other types of housing units in the territory. Warner said he wanted to get better housing for the people of Bathurst Inlet, who lived in shacks on the beach, so he went to see Stuart Hodgson, then NWT commissioner. Hodgson told Warner that he didn’t have any specific budget set aside for social housing in Bathurst Inlet, but could find $27,000 from a so-called slush fund to cover the shipment of construction materials to the community. That’s how the territorial government, minus today’s bureaucracy and legislative assembly, operated in those days. So, Warner submitted two possible housing designs to the community — one for a “normal” house and another for a dome. Everyone opted for the domes. These were prefabricated in Alberta and brought north to Bathurst Inlet by a Hercules aircraft that landed on the sea ice. When more new houses were built, the domes were quickly exchanged for boxy one-bedroom units. 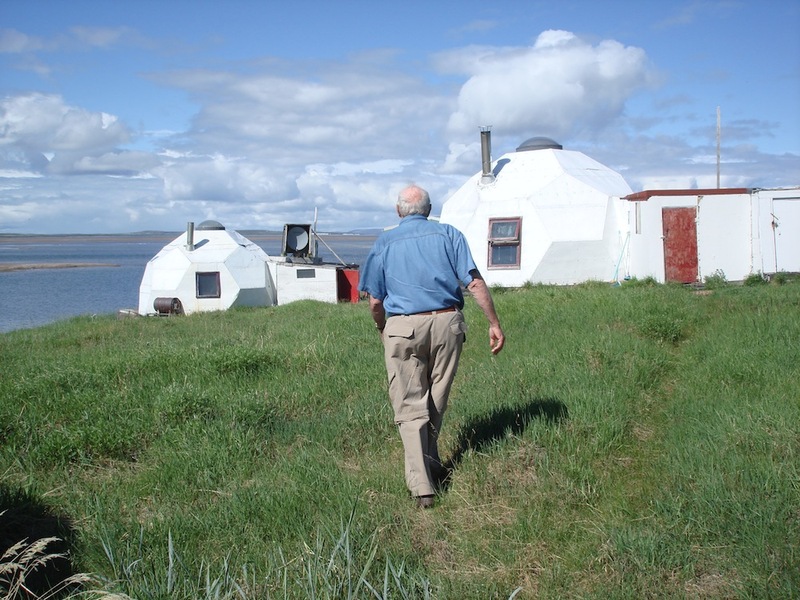 Glenn Warner, who died in 2014 at the age of 80. walks towards two of the three remaining domes at Bathurst Inlet in 2008. Dome structures became popular elsewhere in the Arctic, too, during the 1970s, mainly because the dome shape resembled that of a snow house. Cambridge Bay domes, built in the late 1970s, but later torn down in this photo by Steve Mercer, posted on Facebook. 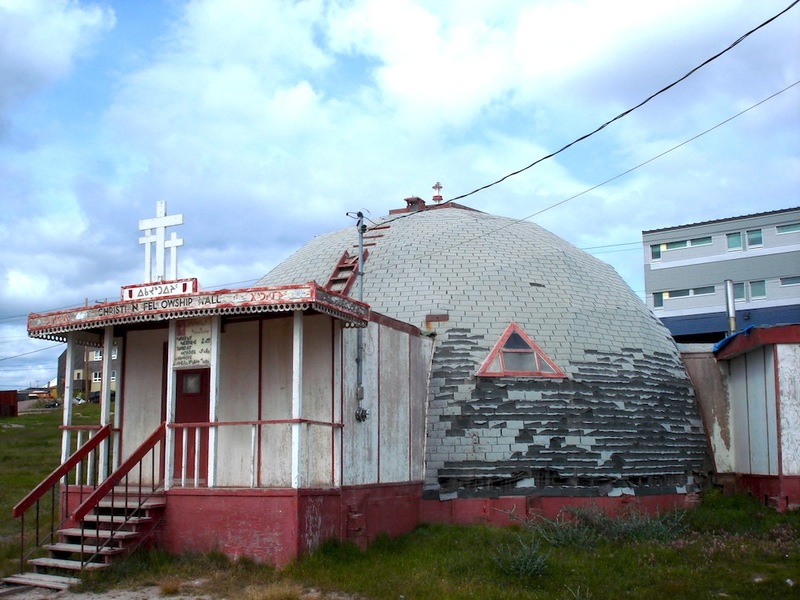 In 2009, I was excited to find a dome that was being used as a church in Baker Lake — and others have told me of domes in other communities. But most of these domes have been torn down, as in the case of the Cambridge Bay domes. Iqaluit’s blue dome, or “igloo,” was finally demolished in 2006 after being plagued by structural problems. The $1.4 million blue structure opened amid much fanfare and controversy in 1993, but the building cracked, leaked, sagged and reacted badly to extreme changes in temperature. The dome served as an office for the Baffin Regional Inuit Association. It also housed the Office of the Interim Commissioner and, after April 1, 1999 and the creation of Nunavut, the dome provided temporary accommodation to Nunavut’s executive and intergovernmental affairs department. A youth centre that then operated there had to close its doors in 2002 after vandals entered and trashed the interior. 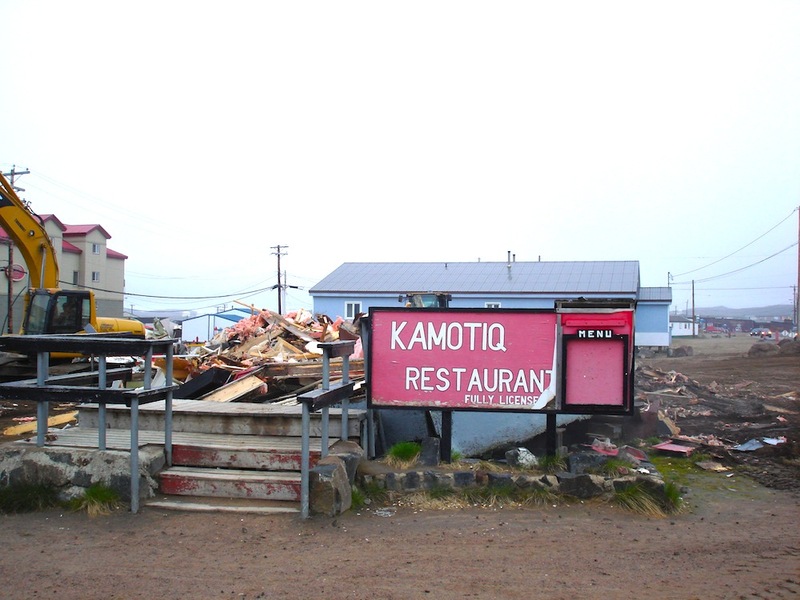 Iqaluit’s Kamotiq Inn, site of many long beer-and-cigarette-infused meetings among Nunatsiaq News staffers during the 1980s and 1990s, was torn down in 2008. Built in 1980, its red dome stood as a landmark at what’s now the traffic-congested Four Corners intersection in Iqaluit. I watched the bulldozer smash into it. Soon, only the sign was left. Farewell to plates of deep-fried maktaaq whale skin and Kamotiq burgers. Fuller’s dome, called “geodesic” after the Latin word meaning “shortest line between two points,” used a network of triangles to create a self-supporting framework. Cheap and easy to build, it’s no wonder domes became fashionable. Back in the mid-1950s, there was even a plan to put a geodesic dome over Frobisher Bay (now the city of Iqaluit), stretching half a mile in diameter. Because the proposed dome would have blocked out the sun, streetlights would have had to remain on 24-7, even during the long sunlit days of spring and summer. In the Nunavik community of Puvirnituq— when it was then called Povungnituk, the museum built in the 1960s, now long-gone. was built as a dome. Here’s what the museum in then-Povungnituk looked like. I pulled this photo of Facebook, where it was posted by Putugu Nulukie. 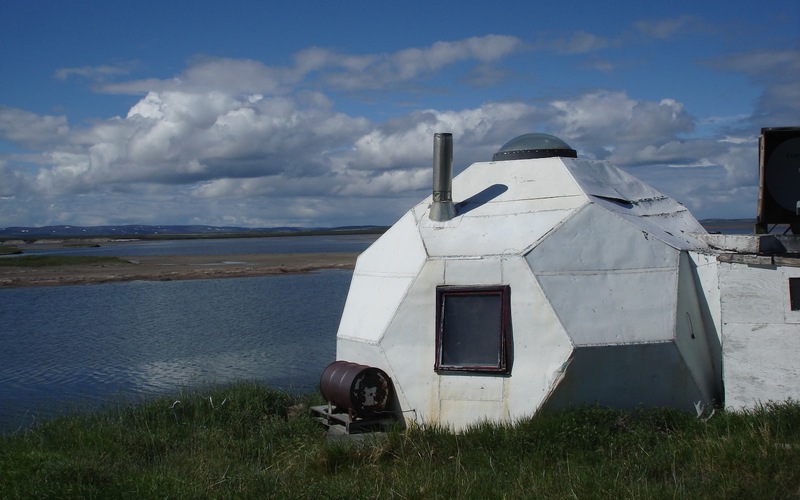 Today, you can still find domes around Nunavik and Nunavut, but not necessarily geodesic ones. These include a museum in Inukjuak, a dome in Sanikiluaq and the dome that holds crushed rock at the Meadowbank gold mine in Baker Lake. The Arctic dome-dream hasn’t yet died: a former Pangnirtung resident recently proposed lowering price of food in this Nunavut community by growing vegetables locally in dome-shaped greenhouses. 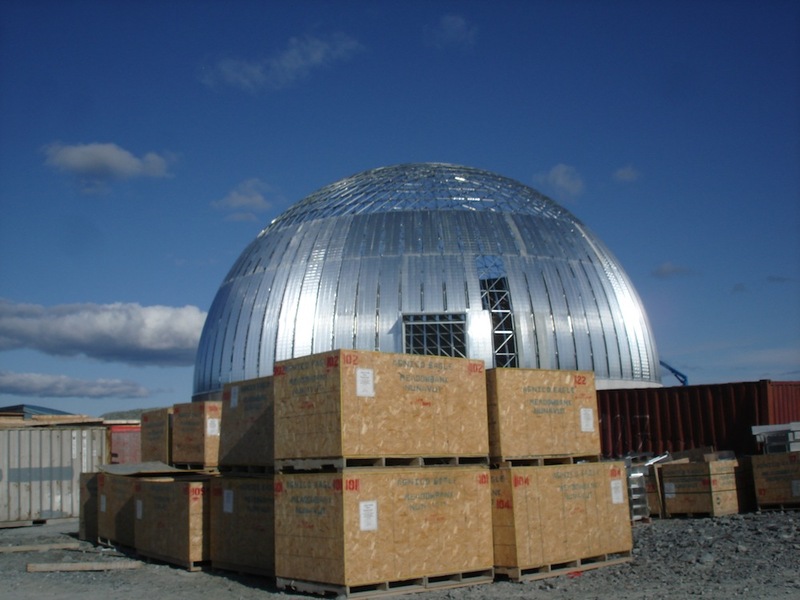 And, at one time, Makivik Corp. hatched a plan to build prefabricated green mini-domes for use by Nunavik hunters. Have you read my last blog post? And then there’s the “Like an iceberg” series about my experiences in the Arctic during the 1990s. In 1972 with the help of friends I constructed a 26 foot diameter geodesic dome in Qikiqtarjuaq, My family lived in it for three years and then it became the coop managers home. It was in use until about 1985 when it was moved and subsequently torn down. It was insulated with 4×8 sheets of foam insulation. It served us just fine. Do you have a photo of your dome? Would be great to see it! Do you know why it was torn down? Thanks for sharing the news of your former dome-home, Bert. I was recently in Bathurst Inlet and was very curious about these exact domes! Was thrilled to find your post about the same ones. they look very different now, totally falling apart on the inside. I am surprised to learn how recently they were built. Thank you for the insightful post, this and your other entries have been very helpful to my research when there aren’t alot of resources like this about the north! From what I’ve found, there is still no decent solution to the housing crisis, do you know of any alternatives that are being put in place? Thanks for the photo of the inside…to learn more about housing options you could do an advanced Google search on the nunatsiaqonline.ca website as I know we have written there about housing and housing alternatives. I haven’t heard of new domes going up though. There is a house in Pond Inlet made of a “Y” shaped set of three water drainage pipes. Each arm is about 12 feet in diameter. It has minimal foot print and stands on about 6 legs. It was constructed between 2005 and. 2010. The owner is an engineer and works for the Gn. The domes in Bathurst Inlet were built in about 1974. I saw them when I was there in 1985. They were only about 20 feet in diameter. They have been basically abandoned since the late 90s or earl 2000. They had problem with moisture build up and mold growth. Page Burt in Rankin Inlet knows their story exhaustively. Joanne an I also have a 26 foot diameter dome the same size as the one we built in Qikiqtarjuaq at out summer place near Saskatoon. We built it in 1978 as a garage for about $1,000. It has been resigned once in the subsequent 39 years.